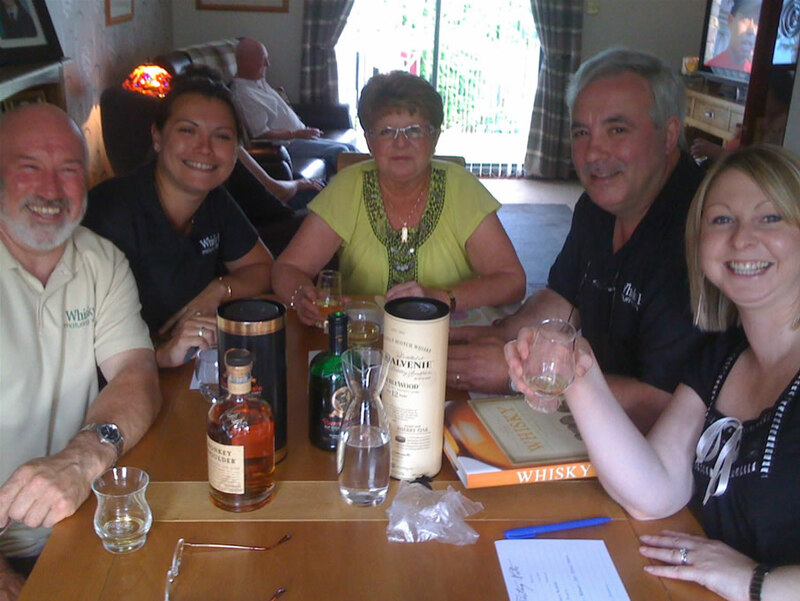 Jim and Dougie travelled over to the other Whisky Boy’s (Nicola) house on Saturday night 6th of June to do a tasting with Kitty, who’s birthday it was, and we were asked to invite her for a tasting as she is a Malt Whisky drinker, and also to be a wee treat for her birthday. (this could catch on, we could do tastings for any event or occasion). The other member of the tasting party is Lee, who is Kitty’s daughter and is also Nicola’s friend and next door neighbour. So as usual we all sat around the table, tasting glasses and water at the ready, let battle commence. Our tastings this evening were to be Bunnahabhain 12 year old and Monkey Shoulder a blended malt. Our first tasting was to be the fabulous Islay Malt, Bunnahabhain. To get back to the tasting, we asked Kitty to do the honours and open the bottle of Bunnahabhain, which she did with all due respect and dignity, that’s what all Islay Malts do require. Finish…Medium to long and a lingering sweetness leaving your mouth slightly dry. Nose…Floral with sherry and fresh sea air. Taste…Sherry and sea salt with a vanilla dryness. Finish…Medium to long, smooth with vanilla and salt. Finish… Warm, smooth and dry. Everyone enjoyed that delightful Single Islay Malt and Kitty was surprised that you could get so many scents and flavours from taking you time and appreciating these fine drams. All our readers will know that the Whisky Boys are for all things Whisky especially the Islay and Island malts and if you get the chance go to Islay and appreciate not only the Whisky, but the atmosphere and the people of this fabulous island. You can read more about Bunnahabhain and Islay in the section Festivals as we are currently writing about our trip to the Islay Malt and Music Festival held last month. It is now time to go to the next tasting, Monkey Shoulder. 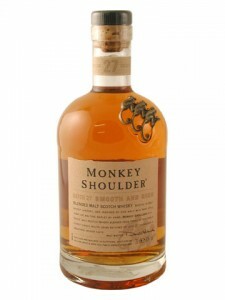 Monkey Shoulder Blended Malt Scotch Whisky. Distilled, Matured and Bottled in Dufftown, Scotland by William Grant & Sons Ltd. The name is taken from the malt men who turned the malting barley with large wooden spades, and this gave a pain/ache on the shoulder which in turn they gave the name Monkey Shoulder to this soreness that occurred. This blended malt is crafted in only 27 casks at a time to ensure smoothness and quality. You can check out all about this Whisky by going to their great website, certainly worth a visit. The Malt Master is one of our favourite’s. David Stewart from The Balvenie famed single malt, see some of our other articles, using the search bar. The Whisky Boys are quite sure that no other blended/vatted malt is this precise, does anyone know any better, let us know, thanks. Taste…Elegant with a touch of chocolate orange. Finish…medium length and smooth, an ideal night cap. Taste…Complex and tongue tingling with citrus and honey. Finish…Non-lingering, dried fruit and faint smoke. Taste…Light and vanilla, very enjoyable. 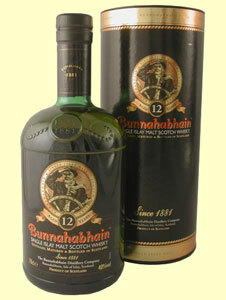 Finish…Short, but preferred it to the Bunnahabhain lighter and a little more refreshing. Taste…light but very smooth indeed. Well that’s another tasting put to bed and a very good one indeed, we all felt that the Monkey Shoulder was a very smooth and easily drunk Blended malt Whisky, this should be an automatic addition to anyone’s Whisky cabinet. Jim, Dougie and Nicola all now have a bottle tucked away in their cabinets. Both Kitty and Lee thoroughly enjoyed their evening of tasting and enjoying two great wee drams. Both the girls said that they will look upon Whiskies now with new eyes and respect. Well it looks like the Whisky Boys did it again, we have 2 new converts in the appreciation of very fine Scotch Malt Whisky. Until the next tasting, may your next dram be your best dram. 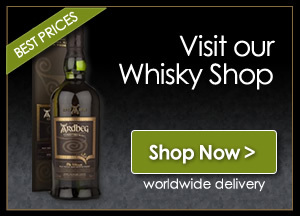 Remember when visiting any distilleries or purchasing any we drams mentioned on our website, tell them the Whisky Boys sent you.